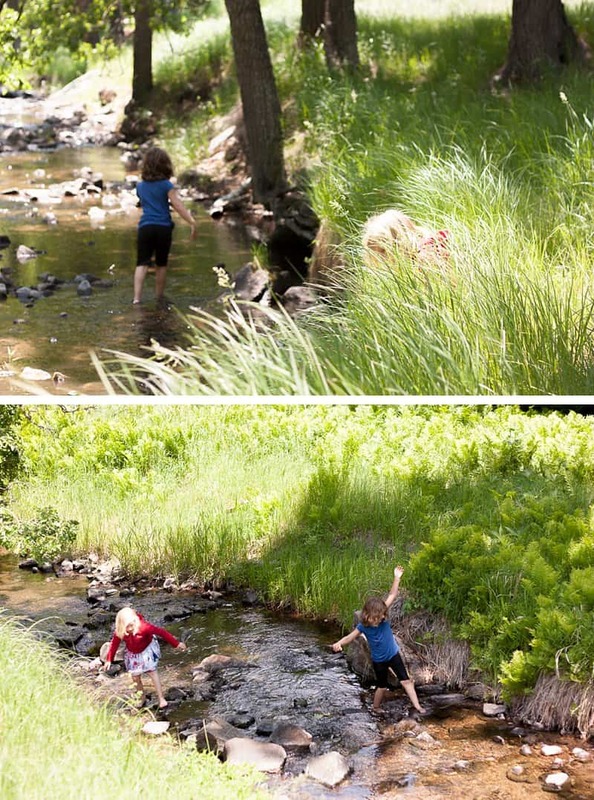 This small slip, this simple phrase that comes out so easily, can unintentionally defeat the entire purpose of bringing your kids into nature to relax and unwind… Thank you to OFF!® for sponsoring this post. I say it… more often than I’d like to admit. I say it… when I’m rushing around helping the kids get ready for school in the morning. I say it… when we’re leaving a restaurant and the girls are dragging their feet. I say it… when my daughter is putzing in the backseat and not getting out of the car. I say it… at bedtime when my girls are goofing around and I want them to put on their PJs. Do you use some variation of this same sentiment with your kids? For the most part, it can be a fairly harmless “Mom prompt” to keep life with kiddos moving along and on schedule. But there are times when I’ve really regretted saying it. My biggest slip-up? Saying it while hiking with my girls. The thing is… Sometimes I don’t even realize the true effects of my own parenting actions until I observe the same behavior in another family. Each time the young boy’s sightings annoyed (rather than entranced) his father, the boy’s smiling face dropped with disappointment. It was at that moment that I realized the irony of my own mistake. Here this father and I are in the woods, both taking our children for a leisurely Sunday hike, attempting to teach them to appreciate nature along the beautiful meandering trails, and we’re forcing them to “Hurry up!” any time something interesting catches their eye. I admit… This shift took a lot more thought, practice, and patience than I had expected. Yet the reward for the change in my perspective has been life changing. 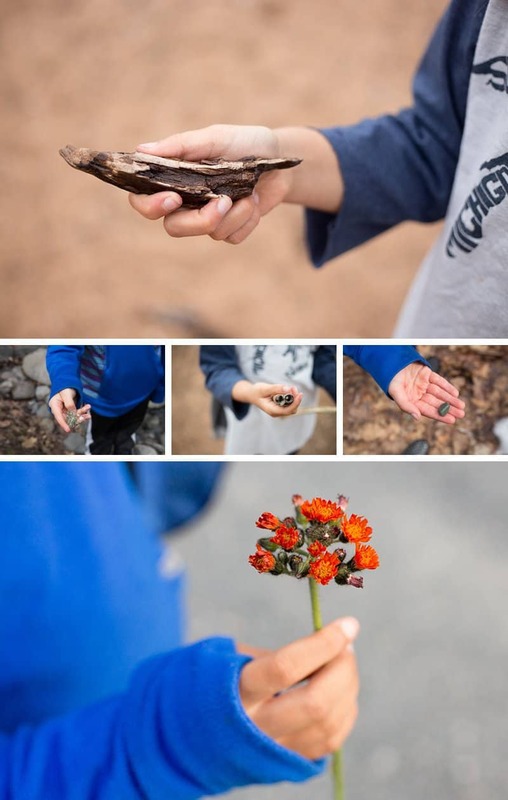 If we slow down to truly embrace the lessons put before us, we can realize that our children are here to remind us of the simple beauty all around. They are a gateway to seeing the world anew with wonder and awe. In order to feel like you can take the time to mosey, amble, saunter around, and generally take in whatever comes your way, prepare for your sloooow-hike by packing a bag of essentials. What you throw (or don’t throw) in your hiking backpack can make or break your experience. A tip: Tame your desire to take your whole house with you. Instead, choose just a few smart, efficient items. 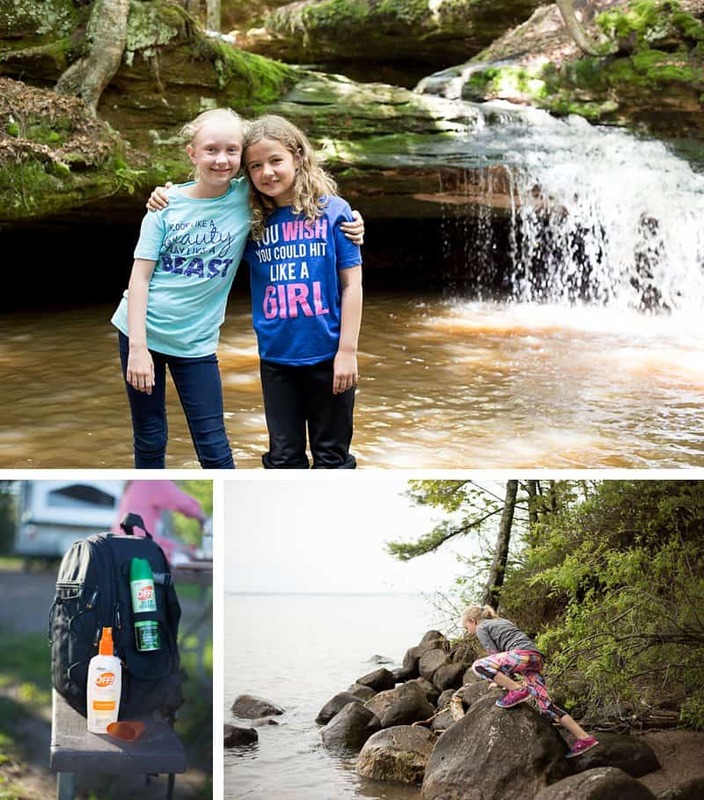 Here are my personal slow-hiking MUST-HAVES I’d recommend for your backpack to ensure your kids are getting the most from their time in the wilderness. As mindful as I am of my own hiking rule, I still have the urge to say, “Let’s go!” after the girls and I have been exploring for a good chunk of time. Instead of falling into that old habit, though, I now pull out a book. Mosquito bites can ruin a family hike in minutes. Stay ahead of this nuisance; throw a bottle of OFF!® personal repellent into one of the outside pockets of your backpack for peace of mind. Then if you encounter mosquitoes on your slow-hiking path, you’re prepared. Don’t allow children to handle insect repellent themselves. Instead, follow the “hands first” method for even coverage: Spray the palm of your hand first, then put the product on your child (see tutorial below). While mosquitoes will not bite under clothing, personal repellents can be applied to clothing to prevent mosquitoes from biting through. Although, some repellents should not be used with rayon, spandex, acetate or other synthetic fabrics (be sure always read and follow the label instructions). Products with a higher percentage of the active ingredient do not offer stronger protection. They just last longer. So choose a product that suits the amount of time you plan to spend outdoors. For short adventures with the kids, OFF!® FamilyCare Insect Repellent IV (Unscented) contains 7 percent DEET and protects for up to 2 hours. When my husband and I go on all-day hikes, we use OFF! Deep Woods® Insect Repellent V, which contains 25 percent DEET and lasts up to 8 hours. Some of the other info in this article might surprise you, too. Click here to read How to Correctly Apply Insect Repellent — 5 tips to keep the mosquitoes off and your groove on. Many insects, including adult female mosquitoes, are attracted to people by the carbon dioxide gas that they exhale. 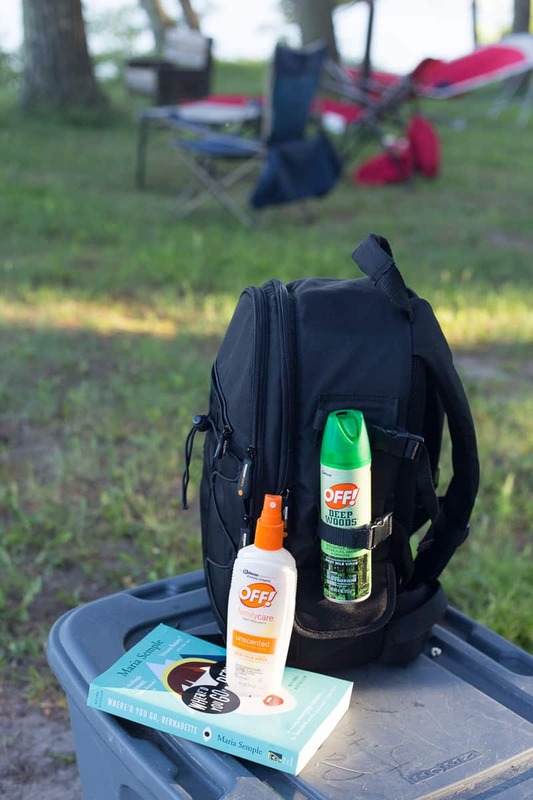 The active ingredients in OFF!® personal repellents (DEET) affect the scent receptors in biting insects, making it difficult for them to recognize you as a QUICK SNACK. Mosquitoes can be such a menace. Don’t let these little guys ruin the perks of a leisurely slow-hike with your family. No matter what the temperature, be sure to bring water to ensure your kiddos stay hydrated. If I know the night before that we’ll be hiking the next day (and we’re leaving from home vs. the campsite), I fill and freeze one of our water bottles. During our hike, we’ll drink the other filled water bottles first. Then, as the frozen bottle of ice slowly thaws, it becomes a great forced reserve if the kids go through their own water too quickly. 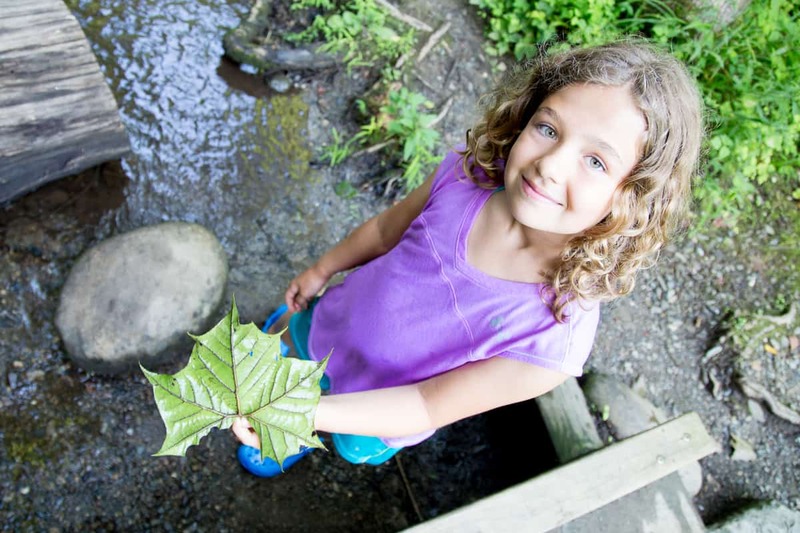 Use the water breaks as an opportunity to get your kids to slow down and observe nature. 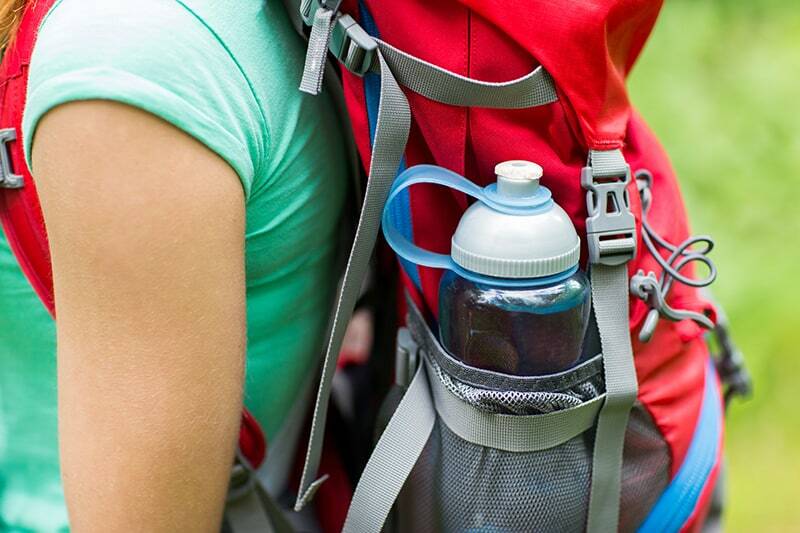 Make a game of finding the best place to take a “water break” on the trail. Safety always comes first. Bring a fully charged phone with you in case of emergency, but be sure to put it on silent mode. Photography is one of my personal hobbies, so bringing a camera on a slow-hike is a must for me. When people see my fancy DSLR camera, I remind them of the classic quote, “The best camera is the one you have with you.” Some of my favorite photos were taken on my iPhone (let’s connect on Instagram). I take my camera on slow-hikes with us because it allows me to have fun capturing photos of the girls truly engaged in nature. When your kids show you something, have you ever heard yourself saying, “Mm-hmm, that’s nice” and not even looking? I’m guilty of this on occasion. To combat that, I use my camera to snap a pic of their “find” to show them that I’m present and see the beauty in their nature discoveries. I take photos of every single “Look at this, Mom” treasure they show me. It may seem daunting, but I love having a visual record of the little things they were entranced by while we were out on our hike. That’s it. My five slow-hiking backpack essentials: book, insect repellent, water, phone, camera. It’s that easy to get packed and GO! Better yet… These five things have helped me let go of using the phrase “Let’s go!” when hiking with the kids. The more time you spend outdoors, the more you recognize the value of minimalism and only taking the things that really help you (and your kids!) stay “on the trail” enjoying and appreciating nature. What are your must-have backpack items when hiking with your kids? Do you have additional tips for keeping slow and intentional when hiking with your family? I’d love to chat more in the comments. Disclosure of Material Connection: This is a “sponsored post.” The company who sponsored it compensated me via a cash payment, gift, or something else of value to write it. Regardless, I only recommend products or services I use personally and believe will be good for my readers. I am disclosing this in accordance with the Federal Trade Commission’s 16 CFR, Part 255: “Guides Concerning the Use of Endorsements and Testimonials in Advertising.” This is a sponsored conversation written by me on behalf of OFF!. The opinions and text are all mine. Purchased it being a present for the the mother furthermore she loved information technology. good quality amazing price tag and my personal mom enjoyed that. Always sent extremely quickly. So if you require a gift fast while like this than this is the someone you will want to buy!